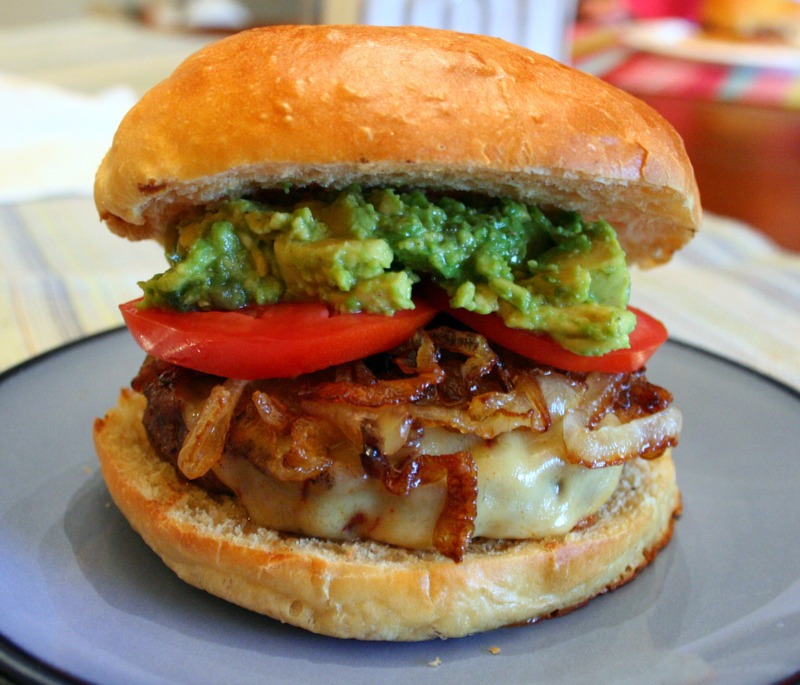 Yum – hamburgers with caramelized onions, chipotle Gouda, avocado, and tomato…so good. Up until today, I have never caramelized onions before, but it couldn’t be easier. If you have 15 minutes, onion and olive oil – you’re golden! Just be sure to stir them around every once in a while so they brown evenly. My house smells amazing and I am going to have to make these every time we make hamburgers now – for the smell alone! 😉 Oh, and if that wasn’t enough to make these burgers special, I made brioche buns. These are light, fluffy and slightly sweet buns enriched with eggs, butter and sweetened with honey. The dough is pretty sticky but so light and pillow soft. These burgers had so many flavors going on – sweet, salty, savory and spicy. I am so hooked on caramelized onions now, I’m going to have to find more ways to use them. Thanks for reading, enjoy! 2 ex-large eggs, room temp. 1. In the bowl of a mixer add the flours(3 cups first), yeast and the salt. Whisk to combine and add the sliced soft butter. 2. In a glass measuring cup, combine milk, warm water, eggs and honey. Whisk to combine and add it all to the dry ingredients. 3. Place a kneading hook and turn on mixer. Mix on low scraping the sides of the bowl to incorporate all the flour. Increase the speed to medium. Knead for 8 minutes…the dough should be tacky and look pretty sticky. If you feel the dough is sticking to the sides too much add 1 TBS of flour at a time until the dough gathers around the hook and slaps around the sides of the bowl. It may still stick a bit to the sides, but not overly. Don’t be tempted to add too much flour or the buns will be dry.~ I probably added another couple of tablespoonfuls of extra flour. 4. Continue kneading for an additional 2 more minutes… for a total of 10 minutes. 5. Scrape the sticky dough that clings to the sides of the mixer bowl and then form all of the dough in a ball. Cover bowl with plastic wrap and let rise in a warm place until at least doubled in bulk and is nice and puffy… 1 to 2 hours. 6. Plop the soft dough unto a floured countertop… sprinkle a bit of flour on top as well. Using a dough scraper, divide dough into 8-10 equal parts. With floured hands form balls and place on lightly oiled parchment-lined baking sheet. Arrange 2 to 3 inches apart on baking sheet as they will rise some more. 7. Flatten the balls down a bit( to about 1 1/2-2 inches or so) and brush with egg yolk. 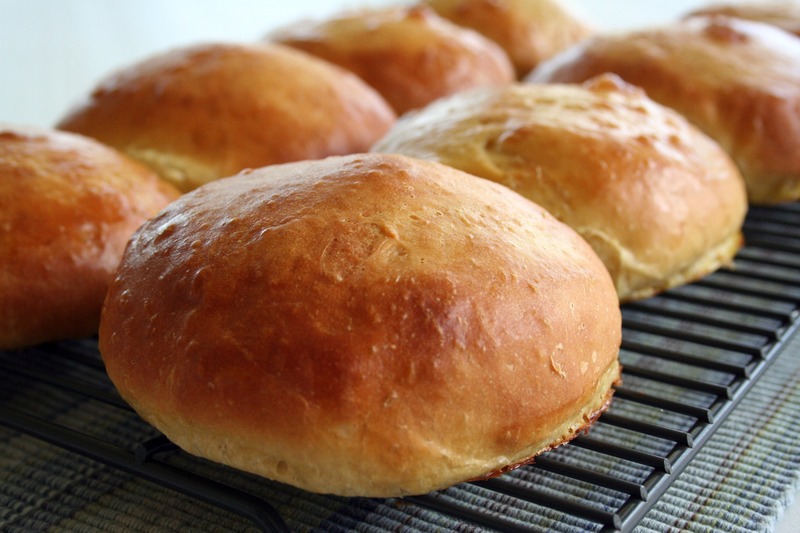 Cover loosely( with oiled plastic wrap) and let buns rise in a warm place for 1 to 2 hours… or until nicely puffed. I adore brioche. Looks really good, but I’m not sure about putting all that in brioche. I’ve always considered it a more breakfasty sort of thing. Maybe I need to open my mind!